titatively converted to the thioglycoside 77 by treatment with sodium methanethiol-ate. Sialylations of 77 were achieved in good yield and stereoselectivity by using phenylsulfenyl triflate (PST) as a promoter and di-ferf-butylpyridine (DTBP) as a proton scavenger. 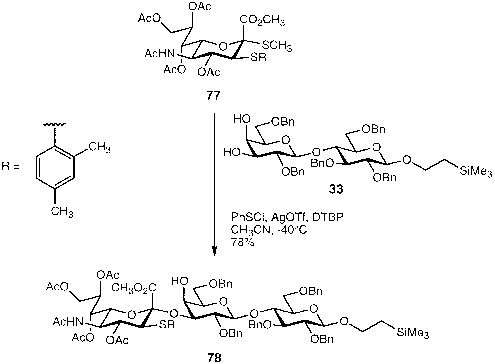 The most impressive application of this donor was for the synthesis of the a-2,3-linked disaccharide 78, which proceeded in 78% yield with no trace of the /3 isomer (Scheme 24). It was also demonstrated that the auxiliary could be efficiently removed by reduction with Bu3SnH and AIBN in 94% yield. 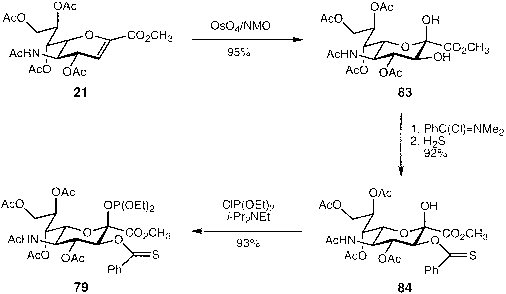 In 1998 the Schmidt group looked to improve the efficiency and simplicity of sialyl glycosylations through the development of a phosphite donor containing a directing auxiliary at C3 . The primary objective was to develop an auxiliary that could be more easily introduced and removed and would more effectively direct the stereochemistry while minimizing side reactions. It was postulated that a better auxiliary might be one that could form a cyclic five-membered onium intermediate rather than a three-membered one. Compound 79 was found to meet the requirements. 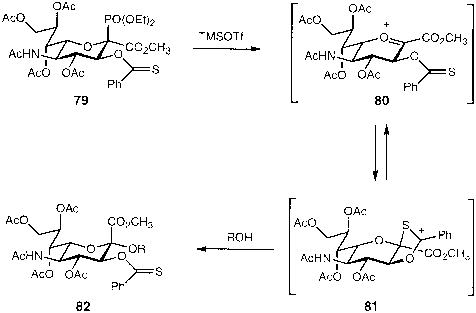 Acid-catalyzed activation of sialyl phosphite 79 should lead to oxocarbenium ion 80 without the need for stoichiometric promoters (Scheme 25). The intermediate oxocarbenium ion should readily undergo attack by the thionobenzoate auxiliary to form the intermediate 81. Incorporation of the thionobenzoate auxiliary, which provides anchimeric assistance through a larger, more favorable five-membered ring, should provide higher stereocontrol than the three-membered episulfonium ions. 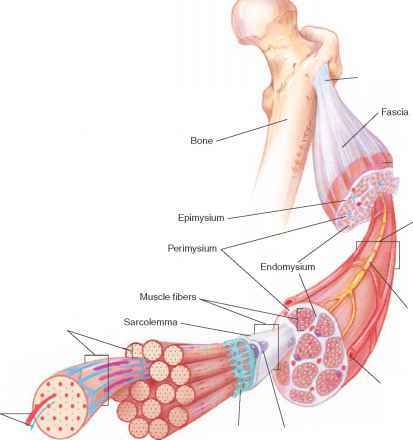 Gly-cosylation should then proceed from the a face to provide the desired sialoside 82. Following this reaction, the thionobenzoate auxiliary should be easily removed by treatment with Bu3SnH/AIBN.